Precision-machined to ensure accurate, repeatable click adjustments for windage and elevation. It features .062" green Trijicon Tritium lamps with white outline. No fitting required, uses factory dovetail, locks in place with two set screws. Made of steel. Rear sight notch width .110". 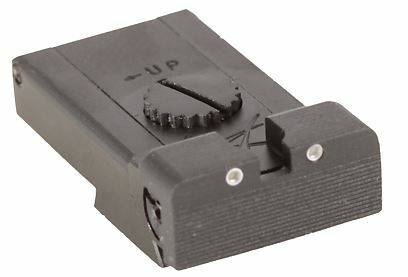 Fits Ruger MKII and MKIII and replaces factory rear adjustable sight. The TL Rear Sight is only compatible with the Ruger Standard tapered models with the addition of the Volquartsen Target Front Sight.